Does your brake warning light stay on? Do you have a squeaking noise or grinding? 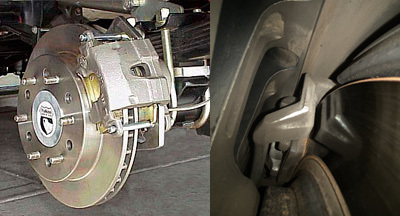 Do you have a low, spongy or hard brake pedal? We can perform a complete brake inspection to find the exact issue. The symptom can be caused by brake master cylinder, power brake booster, drum brakes, disc brakes, brake fluid, rotors or electronic anti-lock brake sensors or a combination of a few. Brake pads and brake shoes are offered in metallic or semi metallic depending on the type of performance you are looking for and most importantly to fit your budget. Remove the wheels and drums; inspect brake friction materials, master cylinder, brake lines, and calipers. Anti-lock brake system warning light diagnostic test per manufacturer's suggestions. Replace old brake fluid and refill with new manufacturer's suggested fluid, bleed air from the system, check for leaks, and finally test drive. We provide brake service (brake pads, rotors, calipers) for clients in Centennial, Englewood, Inerness, Castle Pines, and Highlands Ranch.